Looking to add elegance or change to a room, with your own touch of flair? Consider these options: wainscoting, crown molding and chair railings usually are simple to install but any of them can dramatically change the look of a room. Wainscoting is a paneling, usually made of wood, that can be purchased plain or with decorative markings. Ceramic tile and vinyl also can be used for the same purpose. The paneling is most often adhered to the lower portion of a wall, from the floor to about three or four feet up the wall, creating a unique, but decorative, look to a plain wall. At the top of the wainscoting, some type of molding must be used to adhere the paneling and to protect the wall above the paneling from chairs. Chair rails often can be found above wainscoting, which can be a little tricky to install. However, a simple chair railing, a plain piece of molding that runs about three feet horizontally above the floor, is a little easier to install. Chair rails were originally installed to protect walls from bumps and dents received when chairs were shoved against a wall. However, over the years chair rails have become more of a decorative fixture. Chair rails are usually wood and also can be found plain or with decorative touches. You’ll want to apply chair rails between 24 and 48 inches above the floor. Small markings should be made on the wall prior to installation to ensure the railing is straight, which doesn’t necessarily mean it is level to the floor in every area. 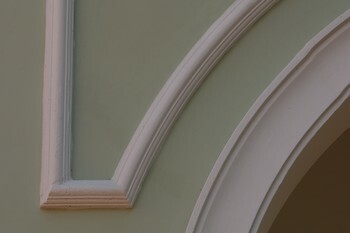 Usually made of wood, crown molding also comes in vinyl strips. Since corners are not always proper, applying crown molding can be a little more difficult to install than a chair rail. With any of these options, you’re looking at a fairly straightforward home project, which will make a huge difference to the elegance and appeal of a space. Add interest to your walls, and you may add value to your home! » Should You Finish Your Basement?